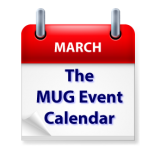 An appearance by Joe Kissell at an Alaskan group and Mac OS Server expert Todd Olthoff, lead the way on this week’s MUG Event Calendar. A Carolina group will discuss FaceTime, a Pennsylvania group will delve into virtual reality, and a N ew Jersey group will talk social media. Wednesday 1-Feb San Diego Macintosh Users Group – All Things Video! Saturday 4-Feb Orange Apple Computer Club – What’s the latest news from Apple? appleJAC – "Consumer Electronics Show(CES) highlights"